Do you work in a primary school? 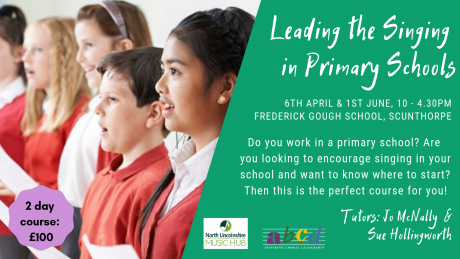 Are you looking to encourage singing in your school and want to know where to start? Do you already have a choir and want to develop your vocal leadership skills? Then this is the perfect course for you! This two-day course, led by Jo McNally and Sue Hollingworth, will cover vocal health and development, basic conducting skills, repertoire and give you ideas for ensemble singing in the classroom. This abcd/North Lincolnshire Music Hub Education course also takes place June 1st. Price: £100 (instalment plans can be agreed when booking) for two days of training and copy of Young Voiceworks (RRP £30.95).